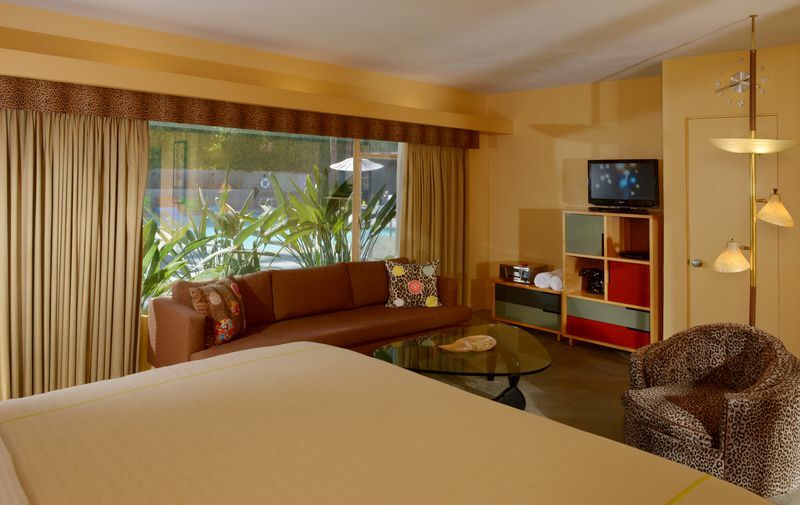 Sparrow’s Lodge combines the best of a social Palm Springs experience and a relaxing retreat. Guests post up on the lounge chairs around the pool and share family-style meals under a gorgeous vine-covered trellis (a daily breakfast spread, Roast Chicken Wednesdays and Steak Saturdays). 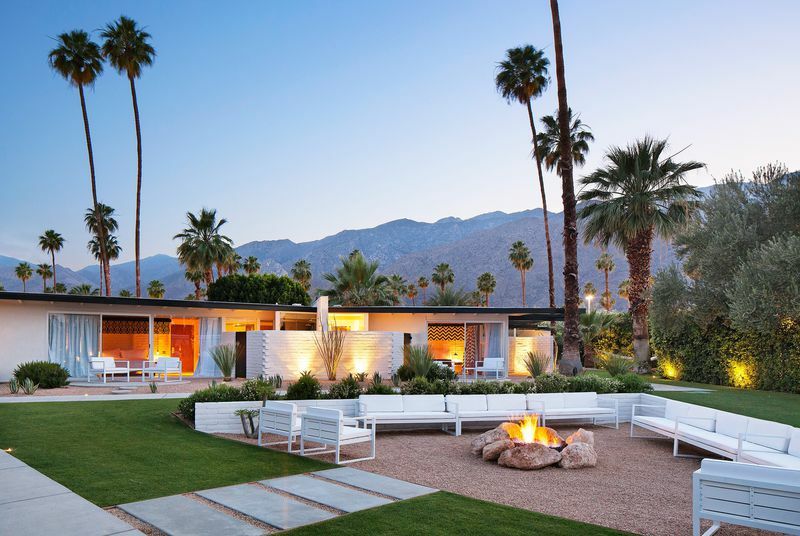 We get that some Palm Springs visitors want to be steeped in mid-mod 24/7, but the rustic Craftsman-meets-red barn style at Sparrow’s Lodge is a nice break from that. You’ll still get desert minimalism, though. Massage and spa treatments—including sage smudging—take place in the cute little massage tent, and while there are no televisions or phones in the rooms, there are private patios and deep horse trough soaking tubs, so you can return to HGTV bingeing when you return to reality. Both are stunning, with fountains and saltwater pools, gorgeous landscaping and gardens, and little nooks to discover. It’s fancy, but cool. The New York Times called Korakia one of the sexiest hotels in the country—it’s not wrong. Hipster haters might roll their eyes at Ace Hotel, but as the saying goes: haters gonna hate... and miss out on one of the best stays. A weekend at the Ace can be an endurance-event party, if you want it to be. But during the week, it’s a sleek oasis, quietly humming with creative types, retreaters, and Monday night Bingo players. Even if you’re staying somewhere else, stop by for a diner delight at King’s Highway or a drink in the Amigo Room. 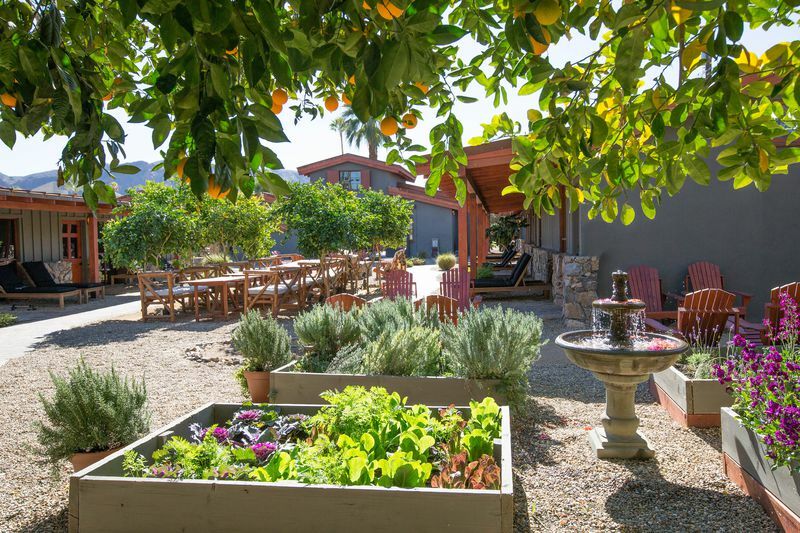 If the Del Marcos Hotel is the spunky vintage-shopping sister, La Serena Villas is the sorta-preppy-but-kinda-earthy and perfectly curated sister. It’s still a historic property, built in 1933, but it reopened in 2016. Each of the hotels’ 18 villas has a private patio and fire pit and a clawfoot tub. The rooftop bar is also a highlight—it’s a great spot to soak in the mountain views. 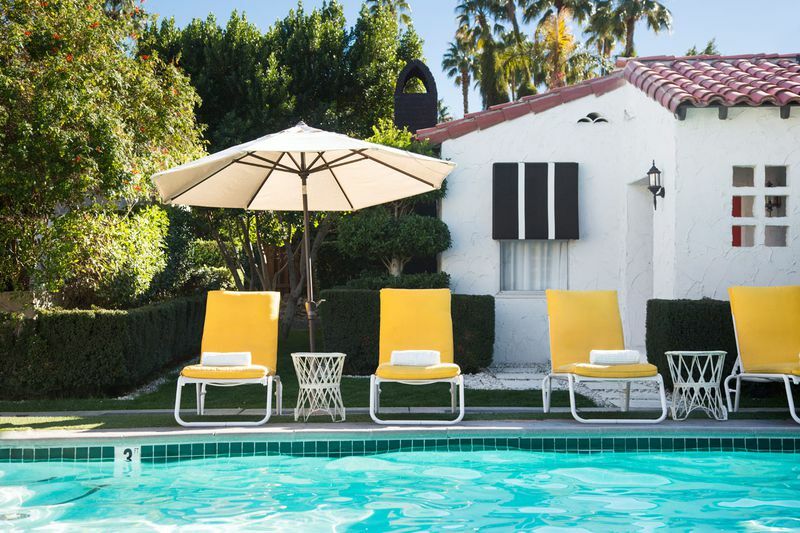 Amid the Tennis Club neighborhood’s tiny and trendy hotels, the Avalon Hotel and Bungalows is a nice Hollywood Regency palate cleanser. Do those exist? They do here, with super cozy and private bungalows around pristine hedges and perfectly green lawns, drought be damned. The rooms of black and white, with mirrored accents and pops of color, will satisfy even the biggest Golden Age nostalgic. The deli Wexler’s (of LA’s Grand Central Market fame) draws locals and guests for lunch, and even if you’re not a guest, you can lounge by the pool during lunch as if you were one. 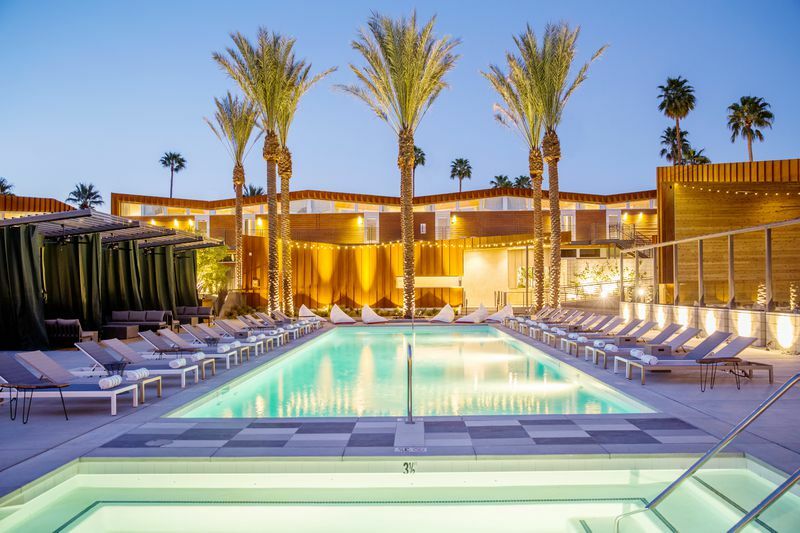 Like many Palm Springs hotels, the pool is the center of Arrive’s universe. There’s a calendar full of parties, poolside yoga sessions and craft markets to fill a short stay. At the very least, stop for a scoop of date ice cream or avocado ice cream (in a pretzel cone: do it) at Ice Cream & Shop(pe) on your way out of town. Is it a pun, or a spelling mistake? It doesn’t matter. 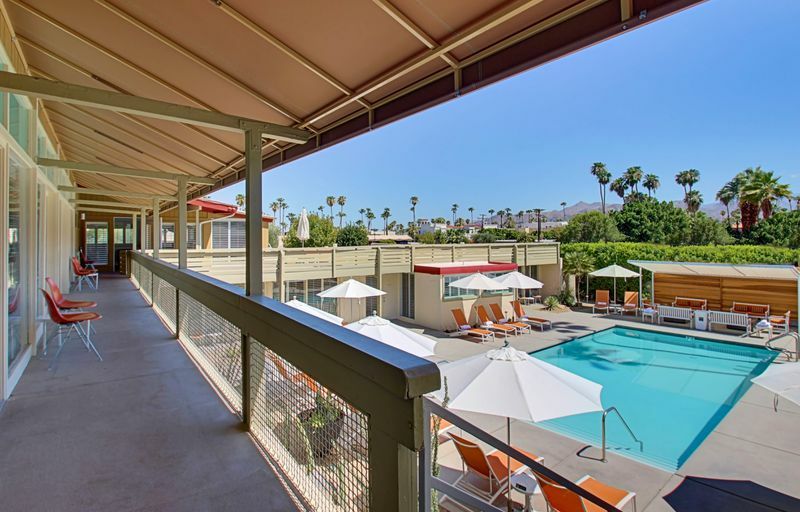 The Orbit In is one of the most fun places to stay in Palm Springs, because it does midcentury modern kitsch right. 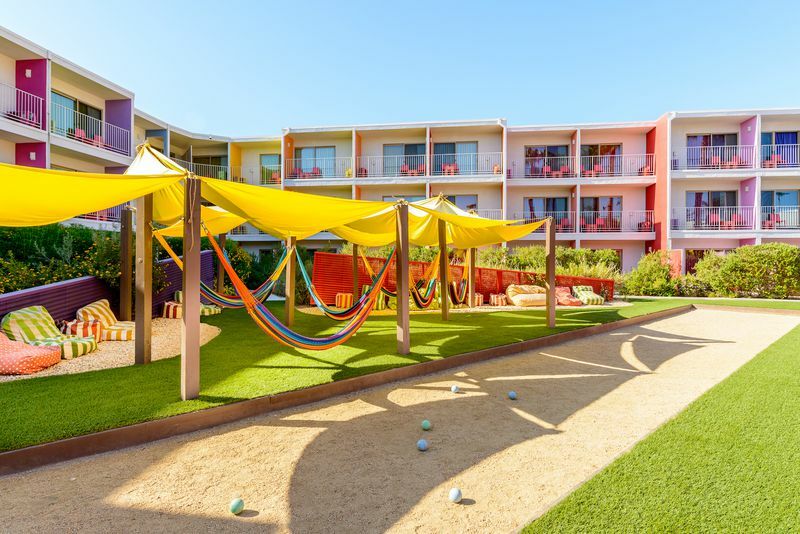 There are record players and a vinyl collection in every room, a free “Orbitini” at happy hour, a nice saltwater pool, and a seat for you at the Boomerang bar. It’s like staying at your hip grandparents house, but way cooler. 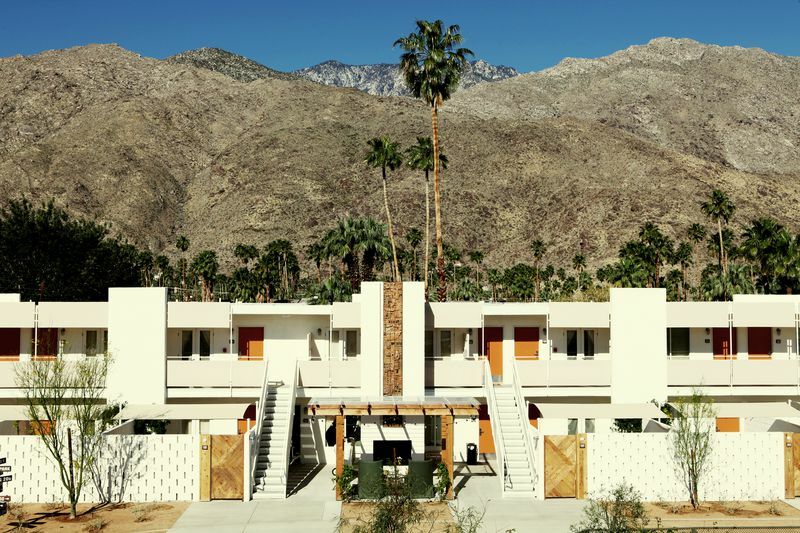 Palm Springs has gotten so... hip, you know? La Quinta Resort & Club is where you should go if you’re over everyone and their dreams of desert Insta-fame. 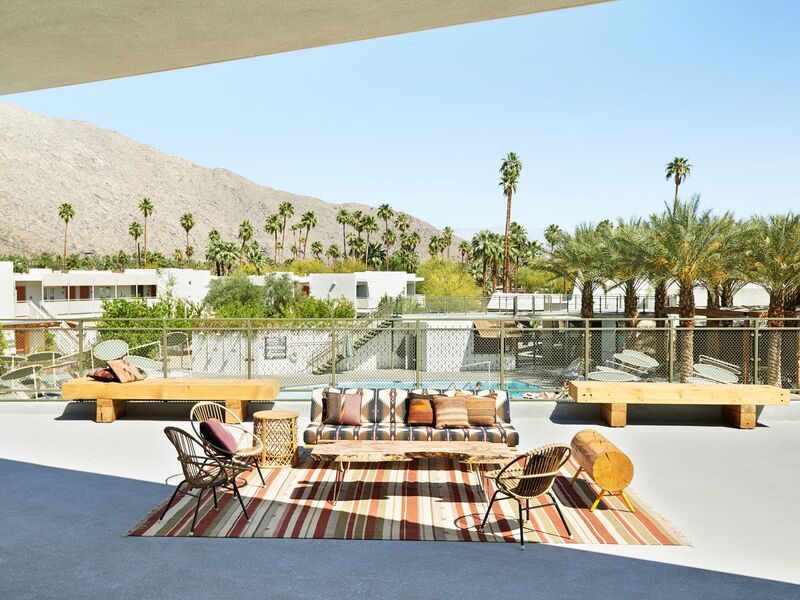 The resort has all the trappings of a gorgeous desert resort—little villas and pools everywhere, mountain views, perfect landscaping, Hollywood history—and all of the peace and quiet (and luxe spa treatments, golf and tennis courts) that a trendy Palm Springs hotel just doesn’t have.